Information about the photographs is provided by the author. 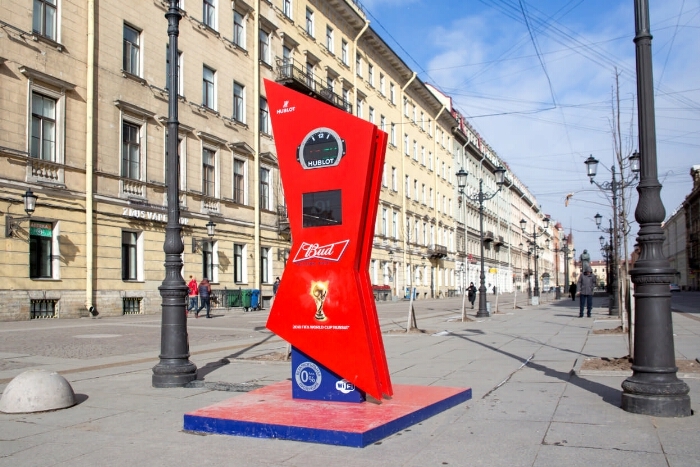 Countdown clock before the World Cup starts football 2018 were installed on Malaya Konyushennaya Street in St. Petersburg 100 days before the start of the championship - March 6. The watch is equipped with a digital timer with a calendar in the form of a judge plate, a video camera and a Wi-Fi router . 1. FIFA World Cup (21; 2018) - Preparation - Photos. 2. The people (the collection). 3. Territory (collection). 4. Territory of Russia: St. Petersburg, city (collection). 5. Sports in Russia (collection). 6. Malaya Konyushennaya Street (St. Petersburg, city) - Photographs. 7. Documentary photographs.